How do I share my Careers 2.0 CV or profile? This is the link in browser address bar when I click on my profile. Should I share that link or there is another way to get the link to your profile/cv? These should be public. If you click on the link, it will take you to your privacy settings page where you can change your setting. 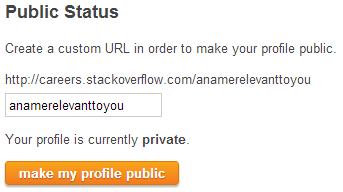 Under Public Status, enter a custom URL at which you want your profile to exist and click on the orange "make my profile public" button. Then you can share your custom URL for people to visit. Not the answer you're looking for? Browse other questions tagged support status-completed careers .